But, today, we have the capacity to Reframe rather than (only) react. Today we know enough about interconnected relationship systems to get ahead of the violence by changing circumstances that lead to imbalance and system failure in the first place. All of us are horrified by the failures of traditional problemsolving. We see fall-out from dualistic, either-or thinking every day. Many of us eagerly embrace “changing the system.” What concerns me is that by continuing to “set up” problems-to-be-solved within the old,polarized framework, even this younger generation risks unwittingly perpetuating the status quo. The good news is that a holistic worldview is an insight all of us can now achieve. The Tao of Nonviolence introduces this process-based, participatory problem-solving model. It will help us perceive of human relations and interactions as living systems; practice the skills of logical, demystified, non-moralistic nonviolence; and, thereby, become the“change we wish to see in the world,” as MahatmaGandhi urged. 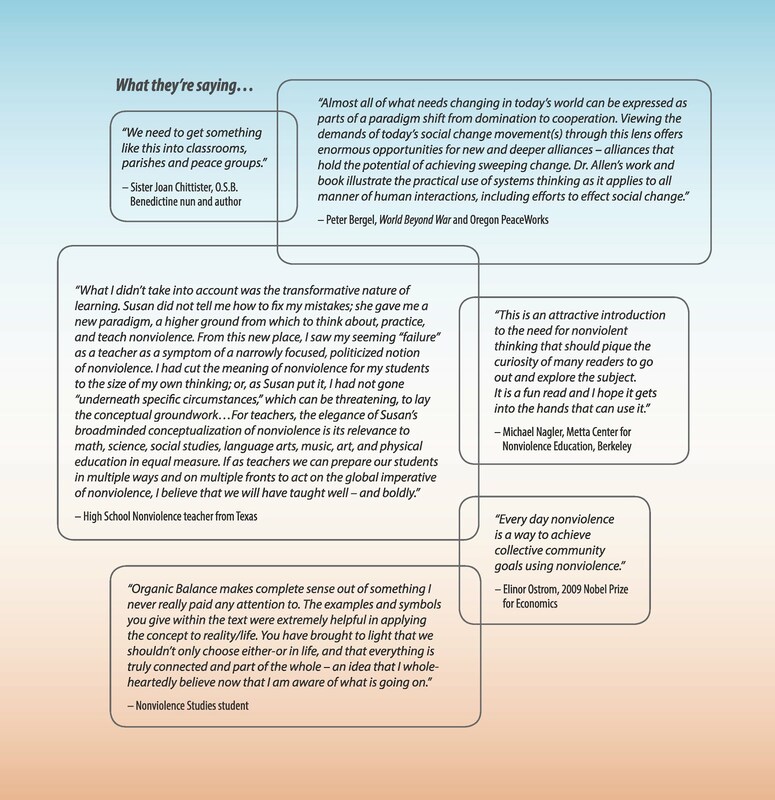 you to see this book - and, if you will, let me know your thoughts about how it might be useful. attention so I could see what they were seeing. became so evident it inspired me to leave some redundancy among the lessons. maintain healthy balance at every level of living relationship. people will become more able problem solvers only when we learn to see the bigger picture and plan accordingly. beginners, and be put into practice starting that very day. I couldn’t find one so I began this one. nonviolence studies students self-select and tend to be such thoughtful human beings, it is hard to decide what to share. from my communication studies theory class. like how the elephant is a he or a she. me. Seeing the either peace of war in the traditional worldview made me think about how I view the world. neat. I was able to see the shifts in thought between each of the sections. of warning sign of imbalance and gave clear examples for each area. the ideas in my own life. perfect line. I was able to relate the image to my experiences. cool how the death dates of famous nonviolent activists start and end the season. crisis before we act to manage our problems we can never change the status quo” to be very powerful. -References- page 100-101. I am a very logically thinker so having references is important to me when I learn. Seeing the long, well put together, list of references gave the book more credibility to me. membes who contributed content to this edition of The Peace Chronicle . In 1994 I published the book, Media Anthropology - Informing Global Citizens (Bergin & Garvey). Some of the ideas from The Tao of Nonviolence had their origins as I tried to persuade journalists to adopt and share more holistic perspectives with their media audiences. To make a long story short, at some point I realized, yes, we need media anthropology - i.e. we need journalists to help inform global citizens by making holistic perspectives available. However, we also needed actual people, by the millions, to become involved in the massive re-education effort to update our worldview -- from dualistic to holistic. It was then I realized the nonviolence movement of movements was and is such a critical form of self-education and action. Someone asked "What ideas are in the Tao book?" - and, how -- as seemingly disconnected problem-specific nonviolence groups begin to overlap -- the larger community can rely less on "mopping up the blood" of violence and more on the principles of nonviolence as an organizing principle that can move us in the direction of health, peace and sustainability. Another thought. I went to a talk/film on "permaculture" last night and was struck by how many of the Tao of Nonviolence ideas are relevant. Permaculture is about creating sustainable living systems, too, but primarily focused on humanity's relationship with the Earth. That said, so much of its promise reflects WHY I wrote my book. My take on sustainability is more abstract and overarching - because it is an attempt to encourage people with all kinds of interests to take up projects /actions with the intention of creating sustainable systems. As someone in the Permaculture film said, however, all of our current thinking is "on the cutting edge of a thousands year old recognition of interconnectedness." etc! 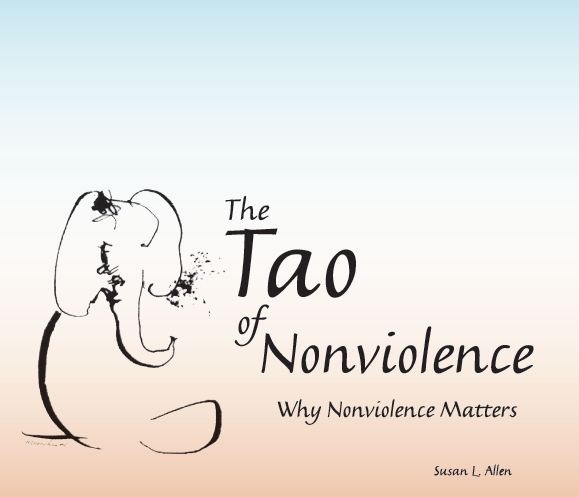 Links and discussions related to The Tao of Nonviolence are available through this page. I am adding the links. The Tao of Nonviolence - Why Nonviolence Matters (2016), is available on Amazon. Susan L. Allen is an anthropologist and director emerita of Nonviolence Education at Kansas State University, a position she used to develop systems-based campus and community projects and an academic Nonviolence Studies Program. She continues to teach online through K-State Global Campus. Allen holds a doctorate in Media Anthropology from the University of Kansas (1980), with fieldwork at the East-West Center in Honolulu. She has worked in Japan, with the U.S. Senate, as a journalist/editor in Hawaii and at a university minority and cultural affairs office, and as director of a Womens Center. Allen is a Fellow of the Society for Applied Anthropology and was awarded the Kansas Peace Prize in 2011 for progressive community leadership. Earlier works include Media Anthropology: Informing Global Citizens, Bergin & Garvey, 1994.